Natural Migraine Relief Glasses Compete in "Innovation Idol: Superhero Edition"
I had 1 – 2 migraines per week, saw Dr. Bradley Katz, got some FL-41 ‘rose colored glasses’ and the migraines went down to about 1 every 2 months to maybe one every 4 months now. Axon Optics presented its natural migraine relief FL-41 glasses at the recent “Innovation Idol: Superhero Edition.” Judges selected the technology as one of four innovations with the potential to improve quality of life for thousands or millions of people. A new Salt Lake City museum, The Leonardo, hosted the event. According to Axon Optics, a University of Utah spinout, over 90% of migraine sufferers are sensitive to light – a condition called photophobia. The FL-41 glasses use a special coating that can block the light that triggers migraines. Optics researcher, Steve Blair, had just seven minutes to demonstrate the natural migraine relief power of the glasses and persuade the audience and judges that the innovation deserved the “Superhero” title. By chance, judge Brady Canfield, needed less time than that. He happened to be wearing FL-41 glasses. Speaking about his experience with the glasses, Canfield said, “I had 1 – 2 migraines per week, saw Dr. Bradley Katz, got some FL-41 ‘rose colored glasses’ and the migraines went down to about 1 every 2 months to maybe one every 4 months now." Photophobia is the focus of several studies through the University of Utah Moran Eye Center. 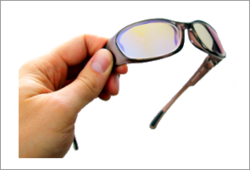 The Center’s studies show that FL-41 tint does reduce light sensitivity. Axon Optics plans to release its next generation migraine lenses this summer and is also working on developing contact lenses that reduce light sensitivity. Axon Optics was born after a Neural-Ophthalmologist, an Optics Researcher, and a marketing professional got together during the summer of 2010 to figure out how to help people with photosensitive migraine using the latest research performed at the Moran Eye Center at the University of Utah. The first line of products, based upon the FL-41 tint, was launched in June 2011. Research is underway at the Moran Eye Center to develop an improved migraine preventative coating; new products based upon this coating will be launched as soon as clinical studies have been completed. For more information about Axon Optics, visit: AxonOptics.com.